Björn Hultén is a furniture designer and interior architect. More than 200 chairs bear his signature, the most famous is the chair H55, created in 1955 to Berga Form, and become an indisputable icon of outdoor furniture design. After more than forty years of experience and interior design for private clients, commercial or administrative areas such as over forty embassies around the world, Björn Hultén was devoted to teaching furniture design at school design and Arts in Gothenburg. 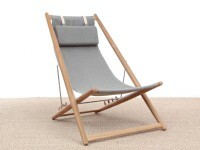 Mid-Century modern scandinavian outdoor dining chair in solid teak by Björn Hultén. Model Kryss. New edition.